The municipal skateboard ban is the “get off my lawn” of transportation policies. Outright prohibitions of this healthy, cheap, and environmentally friendly form of transportation are common. These laws — enacted in towns including Lakewood, Ohio, and Atlanta, Georgia — seem based at least in part on stereotypes applied to people who skateboard, particularly boys and young men. For all that cyclists and pedestrians have to deal with, skateboarding is arguably the most marginalized mode of active transportation. Network blog Decatur Metro says that’s the case in this relatively progressive, inner-ring suburb of Atlanta. 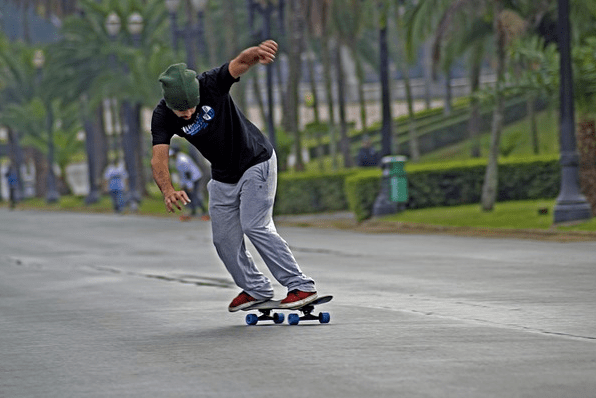 An ordinance passed in 2010 not only bans skateboarding but in-line skating and roller skating — yes, roller skating. Back in 2010, the Decatur City Commission outlawed riding skateboards, kick scooters, rollerskates/blades in downtown Decatur after receiving resident complaints “about skateboarders who disregard pedestrians and cause unsafe conditions on crowded sidewalks and in crowded public areas,” along with damage that was done to the Celebration Statue on the MARTA plaza. And while the damage to public and private property is inexcusable, the ordinance went far beyond that, making it illegal to ride any of these vehicles in the downtown “pedestrian zone,” which is basically most of downtown Decatur. This seems a relevant discussion for Decatur, which has mainly focused on accommodating pedestrians and cyclists. While walking and cycling are certainly the most popular forms of alt-commuting, Decatur’s downtown MARTA train station would seem a good reason to take a second look at this broad ordinance. Taking a legal form of transportation — like a bike — on a MARTA train is certainly more cumbersome than taking a kick scooter (aka Razor scooter), a skateboard or a pair of rollerblades on the train. But to do so, you’d only be able to ride the board/scooter/blades to the outer limits of the pedestrian zone and then walk to the station from there. Elsewhere on the Network today: Greater Greater Washington reports that as Arlington, Virginia, has grown over the last few decades, traffic has actually declined thanks to smart planning. Human Transit explains the danger of putting too much emphasis on travel times in transit planning. And Better! Cities & Towns says an exciting initiative funded by Southwest Airlines promotes place-making in the American Southwest. the comparison between skateboards and cars comes up over and over again. As if the hatefulness of cars somehow justifies more of the same from skateboards. Bikes are silent, just like pedestrians. And trains are very quiet. A plan to put an extra-wide suburban Atlanta thoroughfare on a road diet, adding protected bike lanes in the process, has come under fire from a local columnist with an unhealthy vendetta against people who ride bikes.